" Inhabited] spotlights the complex forces behind the spaces we call home." "The lives of Quimby's finely drawn characters interweave to produce a panorama as wide and full of light as the near-desert setting. Even his minor figures add significantly to the whole, and his skillful and delightful turns of phrase make reading this evocative novel a pleasure." "Quimby's descriptions of Colorado's high country show a painterly flare...an intriguing examination of people and a place in transition." "Quimby's experiences as a Colorado native and an advocate for the homeless provide the novel's backbone, but its real strength is in its cast of vivid, relatable individuals. Recommend to readers attuned to Kent Haruf, Annie Proulx, Laura Pritchett, and Bonnie Nadzam." "Inhabited is an outstanding novel with memorable, believable characters who deal simultaneously with the challenges of reclaiming and redeeming themselves as well as the landscapes that define their communities." "Charlie Quimby is a writer with a big talent, big heart, and big social conscience. In his second novel, Inhabited, characters finely drawn and memorable live amidst the crisscrossing lines of moral conscience, political juggling and economic expediency, a tough neighborhood. I was staggered by the authenticity of these people and their dilemmas." "Charlie Quimby is the sharpest shooter in the West. Inhabited is a dramatic, honest, humane portrait of a Colorado city in the throes of great change and great choice. The characters and the setting are indelibly rendered...We're all in the mix here--rich and poor, homeless and over-housed, rancher and eco-activist, native politician and outside scoundrel. Inhabited is a vivid, compelling story delivered with 21st-century true grit." "A thoroughly enjoyable novel that masterfully takes the reader on an emotionally rewarding exploration of 'home' and the power the concept has on the human psyche." "Inhabited transforms a typical community 'homeless problem' into a layered drama about our responsibilities to each other and the blunders and scars we must endure. I salute Charlie Quimby for following the path of Steinbeck and Orwell in writing empathetic portraits of the ignored and the shunned." Meg Mogrin sells pricey houses, belongs to the mayor's inner circle, and knows more than she's letting on about her sister's death. Isaac Samson lives in a tent and believes Thomas Edison invented the Reagan presidency. When their town attracts a game-changing development, Isaac is displaced by the town's crackdown on vagrancy. As Isaac struggles to regain stability, Meg contends with conflicting roles of assisting the developer while serving on the homeless coalition. Isaac's quest to return a lost artifact soon intrudes into Meg's tidy world, digging up a part of her past she'd rather remained buried. 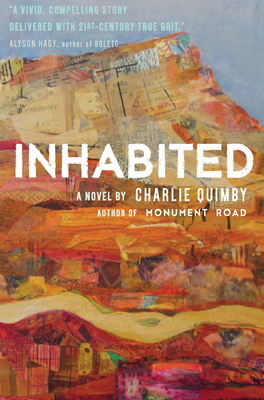 Inhabited, a sister novel to Charlie Quimby's acclaimed Monument Road, returns to the Grand Valley of western Colorado to explore the dimensions of loss, the boundaries of compassion, and the endurance of love. Charlie Quimby is the author of Monument Road, an Indie Next List pick and Booklist Editors' Choice in 2013. He began his writing career as playwright and arts journalist, veered into corporate communications and then founded a marketing agency that now purrs along without him. Along the way, he collected awards and developed the notion he had a few good novels in him. A native Coloradan and adopted Minnesotan, he is at home in both places.